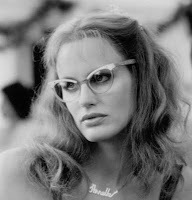 Daryl Hannah: NJAPF* . . . .
Don't limit your thoughts of Daryl Hannah to her "Steel Magnolias" and "Kill Bill" roles. She is one tough debater as the shill for Big Oil finds out in their debate on CBC's "Power and Politics" today. She handles herself very well, is well-versed on the issues and makes a strong argument for the environmental side of this issue. At one point a comment made by the Ethical(?!? )oil rep created the same response from Daryl and I at the same moment: "Oh my god!" (I'm not even a believer in imaginary beings, but that's a whole 'nuther story.) The shill brings out Canadian values of "respect for minorities and gays and lesbians" as a reason to support "fair trade" tarsands oil. Amazing thing to see and one wonders how he sleeps at night. Check out the video here . . . . Match Made in ? ? ? ? 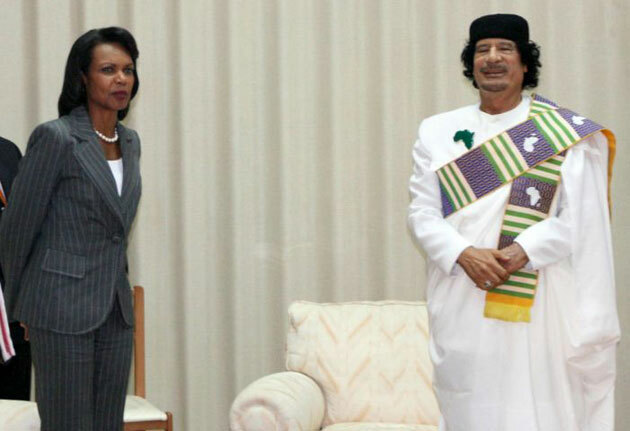 TRIPOLI, LIBYA—Libyan rebels who took control of Moammar Gadhafi’s sprawling compound made a surprising discovery in one of the buildings: a photo album with pictures of Condoleezza Rice. Although "condescending" apparently didn't qualify for moammar's "nurse," she can be comforted in being his fantasy babe. Excuse me while I take a shower . . . .